I love the beginning of the New Year. There’s nothing going on that makes demands on me. It’s when I can slow down, do some thinking and planning, and recalibrate my brain. Whenever I need to get “centered” I turn to my oven, and usually what I want to put into the oven involves fruit in some way. In the fruit bowl on my kitchen counter or in the crisper drawer of my refrigerator there is usually some fruit or other that needs to be eaten or used up. In most instances that would be several black and pretty far-gone bananas in the fruit bowl. It’s embarrassing when someone stops by, and there are the bananas on the counter wearing their black skins, with maybe a few fruit flies visiting them. You know what I mean, I’m sure. Who doesn’t buy a bunch of bananas every time they go to the grocery store. Come on, that can’t be just me. So like everyone else in this predicament, I make banana bread. Familiar, reliable, sweet. It’s a home run. 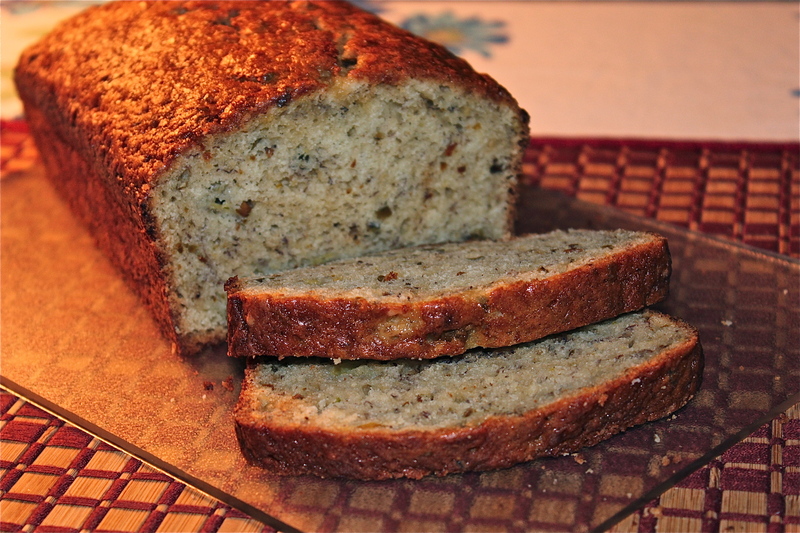 My favorite recipe for Banana Bread was my starting place for this recipe. 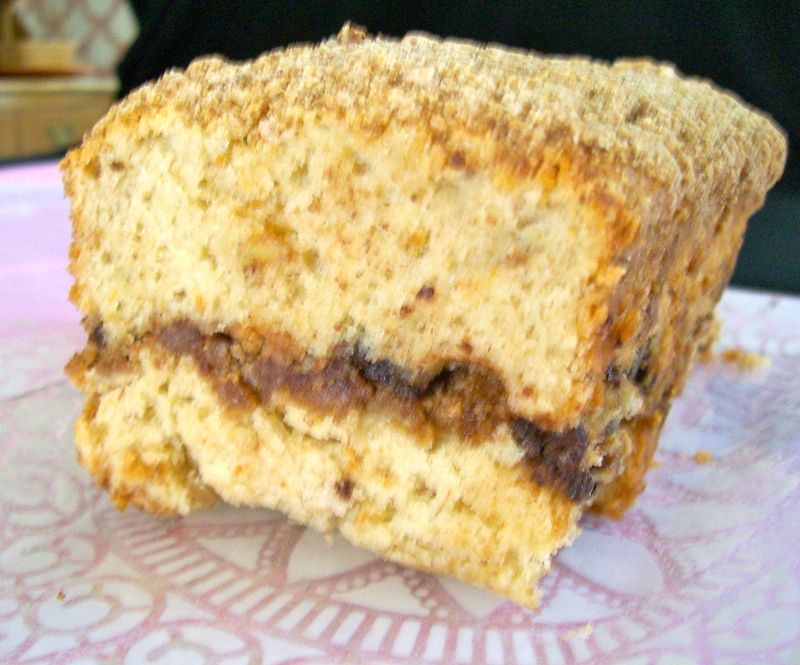 The yogurt in the recipe, in addition to the bananas, makes a nice tender bread, plus the texture it brought to the finished bread was amazing. I added some whole fresh cranberries for some bright spots of color and a zing of tartness amongst the sweetness. They are still appropriate for the season. OK, let’s take a deep breath and relax as we make this bread. This will not be stressful at all! We will get out flour, spices and salt and whisk them together well. Nice fluffy flour, with no lumps. From the refrigerator, take out eggs, yogurt and butter. Now about the butter….why add plain butter when you can add browned butter that’s nutty, fragrant, and has an almost caramelized flavor? Yes, let’s do that! What else so we need? Brown sugar and the mashed banana. This is turning into something special in spite of myself. Stir it all together: flour and spices plus all that banana goodness. Last, throw in the cranberries, pretty little gems. This is the festive part, the bells and whistles. It makes a lot of batter for one 9″ x 5″ pan. This can be one tasty loaf of banana bread plus 1 or 2 banana bread muffins; or divide into 2 smaller loaf pans, one for now, and one to freeze. Don’t even think of baking this bread without some crumbly topping. It’s the decorative ending, or beginning, as that is what you will see first, and tempt you to sample this yummy bread. This bread can do no wrong. It’s moist and soft. Perfect for breakfast and snacking. Studded with cranberries and topped with a crunchy topping. 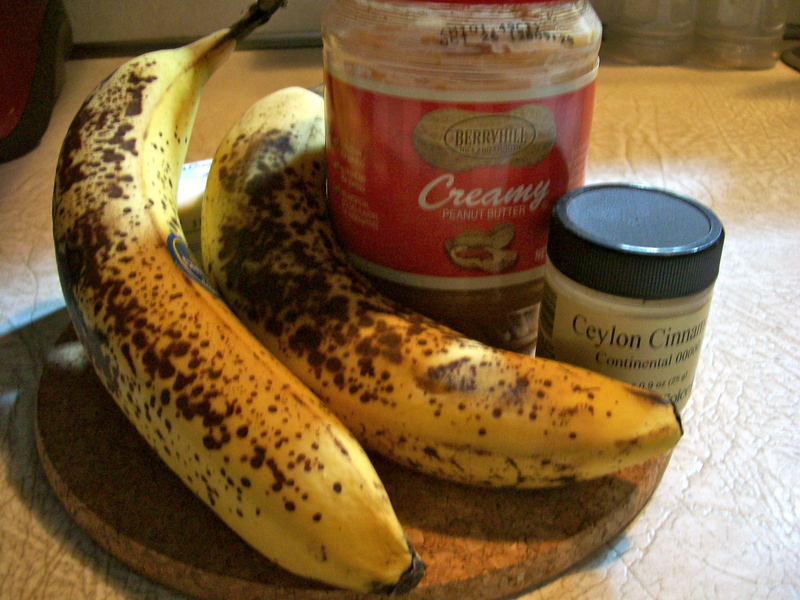 I think you should make a loaf as soon as you have some black bananas, maybe next weekend? 1. Preheat oven to 350*F. Spray pan(s) with non-stick cooking spray and line with parchment paper leaving about two inches of paper to hang over the long sides of the loaf pan. 2. Melt butter in a saucepan over medium heat. Butter will begin to foam and crackle as it melts. When the crackling subsides, the butter will begin to brown. Swirl the pan as the butter cooks. When the butter browns and begins to smell nutty, remove from the heat and transfer to a small bowl. Taking the butter out of the hot pan will stop it from overcooking and burning. Set aside to cool. 3. 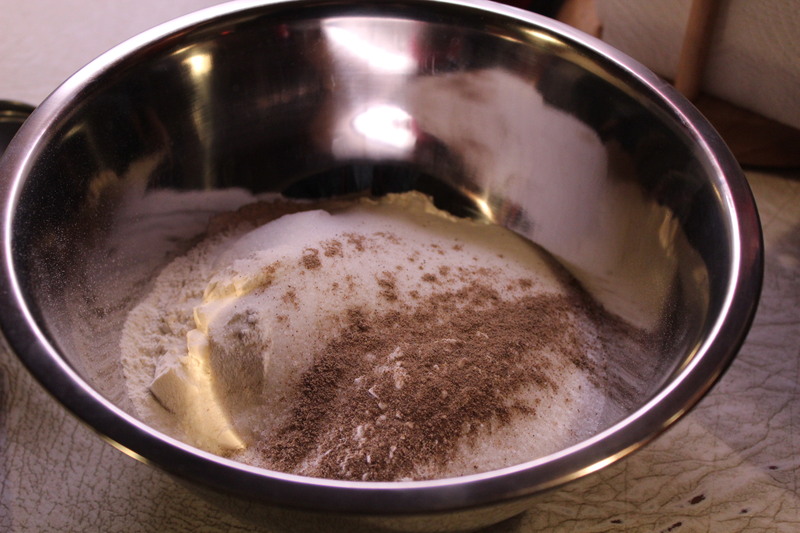 In a large bowl, whisk together flour, baking soda, salt , cinnamon, ginger, and cardamom. 4. In a medium bowl, whisk together eggs, sugar, mashed bananas, vanilla extract, and yogurt. When butter has cooled, whisk in the browned butter. 5. Add the wet ingredients all at once to the dry ingredients. 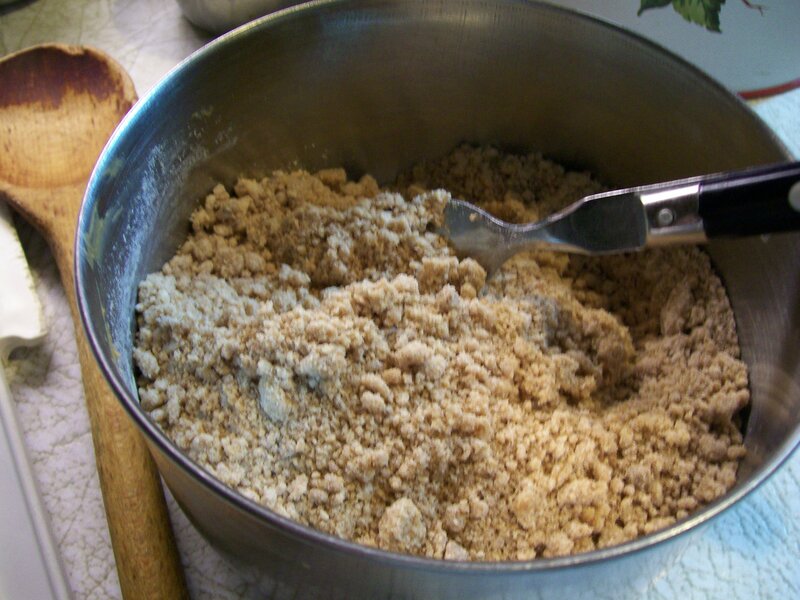 Fold together, making sure to scrape the bottom of the bowl to incorporate any hidden pockets of flour. Fold together the ingredients, taking care not to over stir. 7. Spoon batter into prepared pan(s). Sprinkle the crumble over the top. Bake the loaf for 50 – 60 minutes, or until a skewer inserted into the center comes out clean. Remove from the oven and allow to rest in the pan for 15 minutes before inverting onto a wire rack to cool completely. 8. Bread will last for 4 days, well wrapped at room temperature. This loaf also freezes well. Cardamom Banana Bread with pistachios. I like to use a variety of herbs and spices in my cooking. I love the way they enhance or give subtle flavor to a dish. They can turn the ordinary or mundane into something exotic and interesting at very little expense. So following on the heels of yesterday’s post on ginger, today I want to focus on cardamom. Cardamom is a pod consisting of a pale outer shell which has tiny seeds inside it. It is the seeds that have an intense flavor, but they need to be crushed or ground before use. Ground cardamom is used mostly in baking where its flavor is readily recognized in the baked goods of Scandinavian countries, especially breads, stollen, cookies and buns. 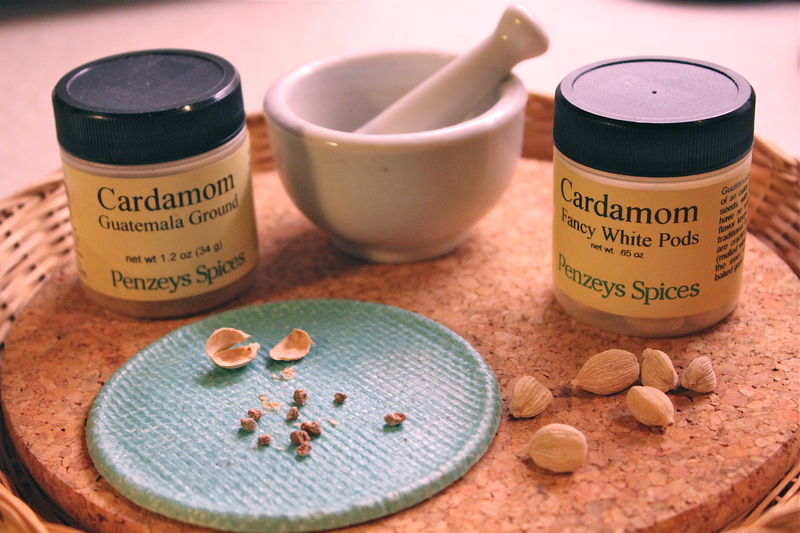 Two varieties of cardamom: whole pods and ground. Cardamom is available in white, black and green forms. It is the white form that we are most familiar with and that which is commonly used in baked goods. In India, however, the black and green forms are important ingredients in meat and vegetable dishes. Black cardamom has a unique smokey flavor, and it is used mainly in curries. If you have never used cardamom, this recipe will provide an introduction, without being overwhelming. The bread will taste like the banana bread you know, but the cardamom will be a stand-in for vanilla. Finely chopped pistachio nuts will provide the crunch. 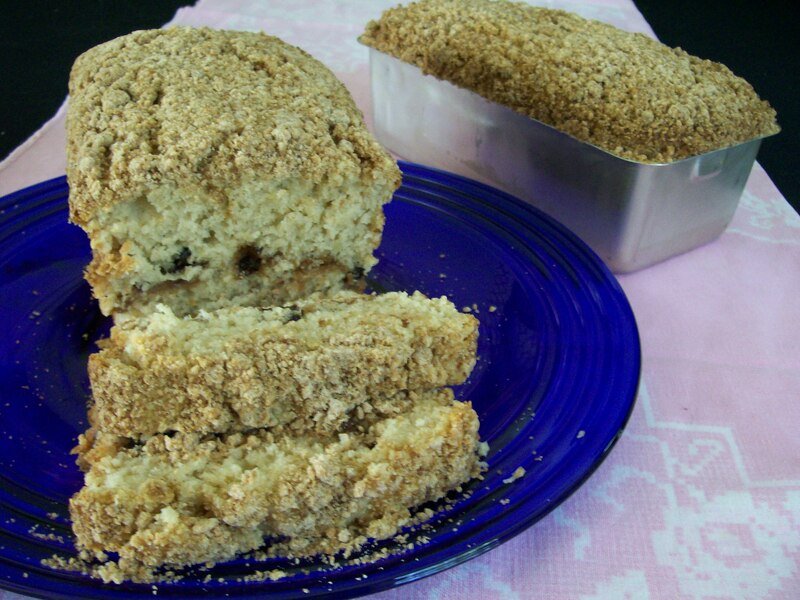 This bread is not a very sweet bread so it is pleasant with coffee or tea for breakfast. Keep this recipe in mind when you are faced with 2 or 3 really ripe (read, black ) bananas—the best kind for baking! I love this recipe because you can mix it all by hand….no need to get out the mixer. It’s so quick to mix up and pop in the oven while dinner is cooking, and be cooled and ready for a snack before bedtime. OOPS, I’m giving away my secrets! 1/2 teaspoon ground cardamom If you like cardamom, this amount can be increased up to 1 teaspoon. 1. 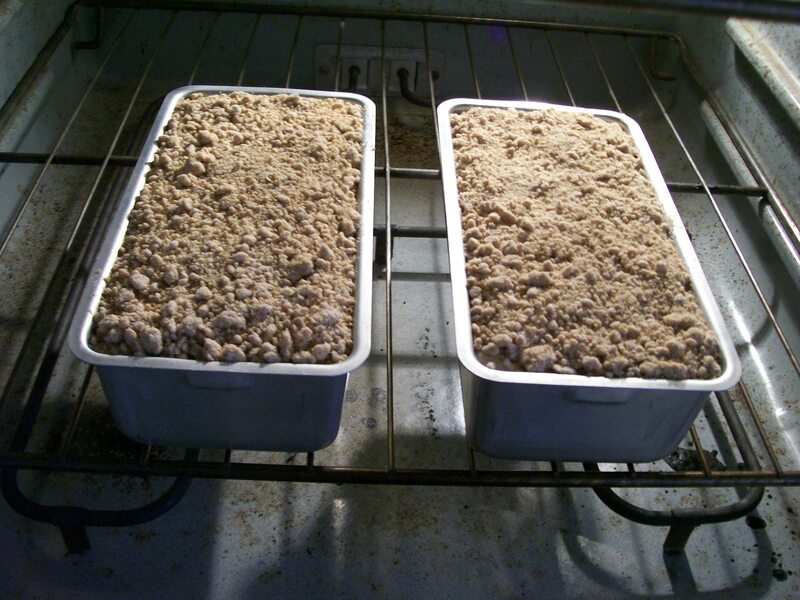 Preheat oven to 350* Lightly grease or spray a 9″ x 5″ loaf pan. 3. 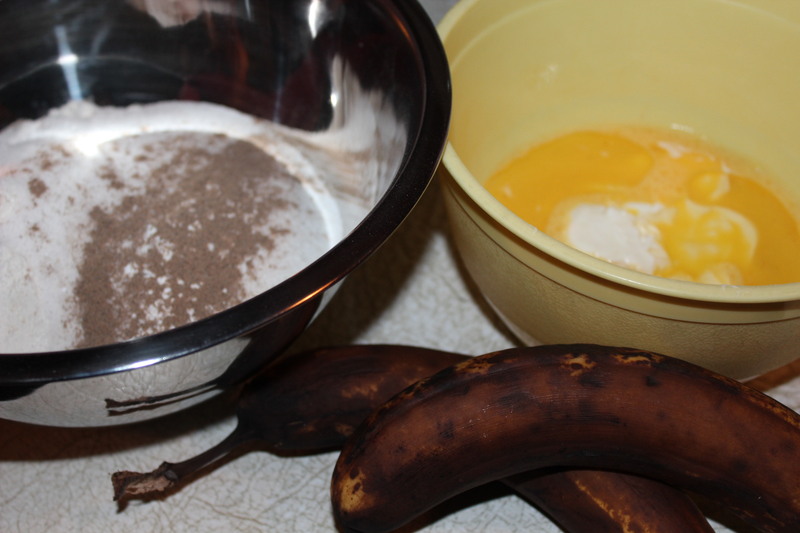 In another bowl whisk together the eggs, oil, sour cream and banana. Everything in two bowls; mix by hand. 4. 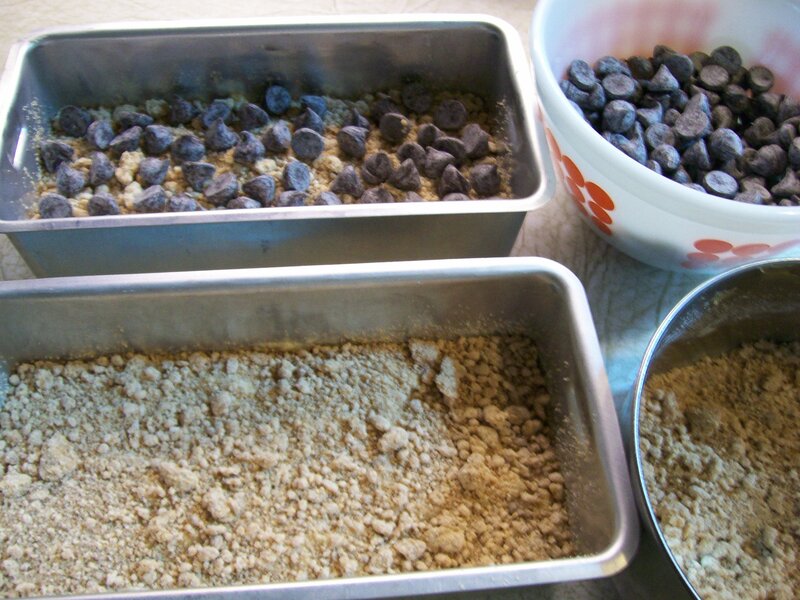 Add the wet ingredients to the dry ones and mix partially. Add in the pistachios and finish mixing, without over mixing. This keeps the bread light instead of heavy and dense. 5. Pour batter into the prepared pan and bake at 350* for an hour or until a toothpick inserted in the center comes out clean. Cool for about 10 minutes in the pan, then remove from pan and finish cooling on a wire rack. 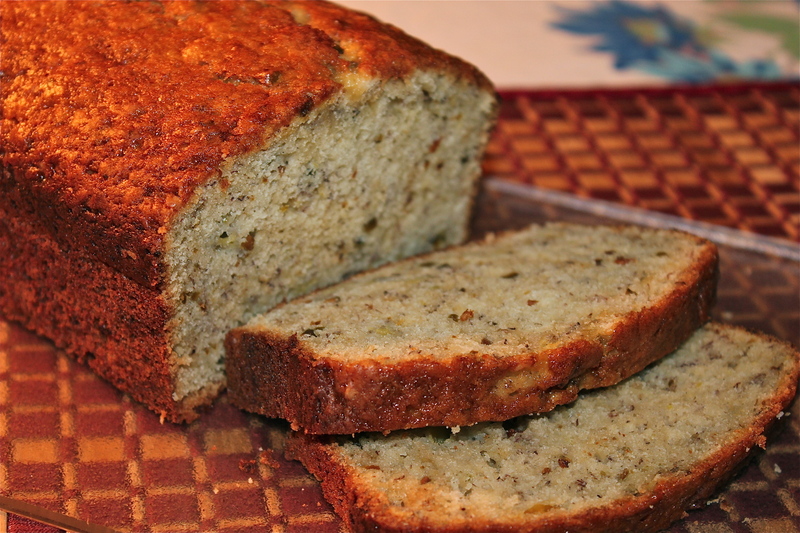 Banana bread, perfect with a cup of tea or coffee. SOURCE: adapted from a recipe in Cooking Light.